Â¶ Matins: At New Geography, Aaron Renn looks at the outmigration of the middle class from “cool” cities, and attributes it, persuasively, to the failure of civic responsibility among “global” elites. Â¶ Prime: PIMCO’s Mohamed El-Erian finds in the Dubai debt standstill “a reminder to all: last year’s financial crisis was a consequential phenomenon whose lagged impact is yet to play out fully in the economic, financial, institutional and political arenas.” We knew this, but it’s great to hear it from an eminent fund manager. Â¶ Vespers: n case the popularity of a current blockbuster has you wondering if you’d like to read the book, Jenny Turner not only reconsiders her review in the London Review of Books but also supplies a list of blogs that offer highly entertaining spoilers about the later novels in this peculiar series. Â¶ Matins: In an important editorial, the Times argues that corporations ought not to have the same set of constitutional rights as human beings. Â¶ Lauds: At The Best Part, four terrific photographs that William Eggleston did not take â€” but clearly inspired John Johnston to take. Â¶ Prime: The Netflix Prize â€” a million dollars to whomever improves the performance of its Cinematch engine by ten percent â€” is not really about the money. Â¶ Tierce: Devin Friedman decides to have more black friends, runs ad in Craiglist… the beginning of quite the project. “Will you be my black friend?“, at GQ. Â¶ Nones: In what seems like a turn from Il Trovatore, ousted Honduras presidentÂ Manuel Zelaya steals back into Tegucigalpa, where he takes refuge at the Brazilian Embassy. Â¶ Vespers: Alan Gopnik reviews Dan Brown’s The Lost Symbol â€” but not in the back of the book. As the lead Talk piece instead. Ho-ho-ho. Â¶ Compline: Nige takes the week off, bumps around Norfolk with an old friend, and visits a famous French cathedral. We are so living on the wrong continent. Â¶ Prime: Felix Salmon provides some helpful background on the most upsetting story of the past weekend. Here’s hoping that he’s right, and that “life settlements” won’t go anywhere this time around, either. Â¶ Tierce: Roman Hans has a problem with his cable bill. Â¶ Sext: Carrie Fisher admits that sheÂ USED TO BE hot. Â¶ Nones: At the LRB, Thomas Jones digs out an 1880Â book about the futility of waging Western-style war in Afghanistan. Lots has changed since then, but Afghanistan hasn’t, not much. Â¶ Compline: Failure and free markets: is it any wonder that the inhabitants of a small island kingdom would be far more risk averse than the settlers of a resource-rich continent? Peter Goodman filters last week’s election through contrasts between Japan and the United States. Â¶ Prime: Robert Rubin, Citigroup, and Glass-Steagall: a brief entry by Felix Salmon (with help from Charlie Gasparino) snaps the pieces of the puzzle right where they belong. Â¶ Nones: What happens when a sovereign power violates its own laws in the interest of self-defense? Barack Obama is willing to think twice. Â¶ Vespers: Carlene Bauer reviews the reissue of Elaine Dundy’s The Old Man and Me, at Second Pass. Â¶ Prime: The news about the Sony Reader makes us glad that we didn’t get the Kindle after all. Â¶ Tierce: Roman Hans explains the real-ity of health care reform. Â¶ Nones: The burkini â€” banned in bikiniland. Â¶ Compline: For safer streets, look atÂ Dutch roads. “Going naked” means that drivers have to think when driving through Dutch towns. Â¶ Matins: It’sÂ Bastille Day â€” but not in France. In France, it’s “La fÃªte nationale.” What do you say to friends on le quatorze juillet? You say, “Bonjour, madame,” comme d’habitude. Â¶ Lauds: You know, before you even start reading, that Anthony Tommassini is not going to give Rufus Wainwright’s Prima Donna top marks. But if you read between the lines, his review begins to look like a rave. Â¶ Prime: RobertÂ X Cringely writes about the MADD strategies of Google and Microsoft, and how, if either of them suffers a mortal blow, it won’t have been aimed by the other. Â¶ Tierce: Pardon me, but I’m no longer interested in the Marshall trial’s verdict, whatever it may be. I’m already casting the movie. Who wants to play Brooke Astor, banging her cane as she is “dragged” into the library? Or saying, “I feel like throwing food in someone’s face”? Â¶ Sext: It’s very easy to make fun of Town & Country â€” if you’re not throwing up into an air-sickness bag â€” but Choire Sicha can be counted upon to do it well. Â¶ Nones: We throw up our hands: both sides in the Honduras dispute request American intervention. What a sterling opportunity to make enemies and influence people to hate the United States. Â¶ Vespers: At The Millions, novelist Sonya Chung tells us what it was like to meet her new book’s dust jacket. Ms NOLA and I got together again this afternoon. I saw Whatever Works at eleven, at the Angelika â€” and, once again, there was sound trouble. (At least the sound never cut out entirely silent, as it did for Elegy, in the same auditorium.) But nothing could diminish the splashing summer fun of Patricia Clarkson’s astonishing performance â€” the most astonishing aspect of which was that an astonishing actress could astonish. (Come to think of it, Ms Clarkson appeared in Elegy as well. Maybe the sound gremlin is her doing.) After the movie, I walked over to Spring Street, between Crosby and Lafayette, to visit a shop that was written up in the Times the other day. What a ha-ha Kathleen had at my expense when I announced that I’d discovered it: she has been going to an uptown branch of Pylones for four years at least (sez she). I bought a bunch of stuff, but this was the piÃ¨ce de rÃ©sistance. At least Kathleen was kind enough to pronounce it cool. Then I hopped on the train and rode up to 28th Street. Ms NOLA and I had a lunch date at La Petite Auberge, an ancient-looking French restaurant on Lex with an ancient-looking menu. There is nothing ancient-tasting about the food, however. Although it’s conservative, it is not preserved. There was much to discuss. It was all utterly confidential and trÃ¨s hush-hush. Ms NOLA actually surveyed the restaurant at one point, to make sure that we were “alone.” By the time we left, there was no need to survey the restaurant, because everyone else had left. 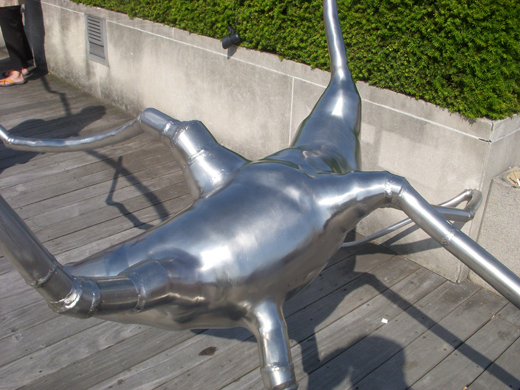 After a little errand at a nearby print shop, we headed up to Yorkville and the Upper East Side, where we eventually found ourselves at the Museum’s Roof Garden. 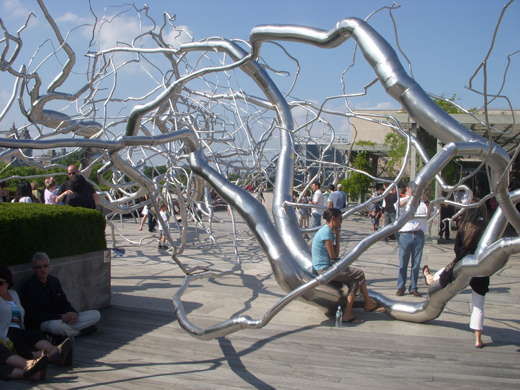 This year’s artist, Roxy Paine, has “planted” the terrace with what looks like a wildly out-of-control potato vine and an ice-bedecked bramble. It was glorious, up on the roof. There was a fine breeze that moderated the beat of the sun. I had a couple of glasses of Prosecco. Ms NOLA soaked up the greenery of the clipped yews that border the garden (not to mention the grand carpet of treetops that separated us from Midtown). Life was good. We went downstairs and sailed quickly through the Francis Bacon show. Â I make a point of visiting the big painting or drawing shows whenever I’m at the Museum, even if it’s only for a few minutes’ visit. That is the luxury of living nearby: there is always time for a quick run-through â€” and for a few stop-and-stares along the way. I have begun to recognize the face of George Dyer even after his lover has rearranged it. Stopping in at Crawford Doyle minutes before it closed, and loading up on great books that I may not live to read, we returned to the apartment and drank tea on the balcony. Eventually, we persuaded Kathleen to come home. Actually, she met us at the New Panorama CafÃ©, where she dared to dine on her usual dish, penne al pomodoro. A consultation with the internist lifted the prisoner-of-war diet. Kathleen is to avoid whole milk, butter, and cream for a week, but she can eat hard cheese, which of courseÂ mean reggiano parmegiano. Last time I checked, she was sleeping comfortably. Ms NOLA hopped on a bus afterward, and I have been here at my desk ever since. It hardly feels like three hours! Â¶ Matins: Tear down that highway! Four cases (two of them in San Francisco) where getting rid of a highway improved congestion, by taking the Braess Paradox seriously. Â¶ Lauds: Fr-eye-day Candy: Vlad Artazov’s witty and beautiful sinkers. Â¶ Prime: At The Corner Office, Jeffrey Pfeffer shows how a misguided belief in efficient markets enables laziness and perpetuates errors. Â¶ Sext: We can’t tell you how wet we think this iPhone app is. What’s more infurtiating than some guy strolling through a subway station as if he actually knew where he was going â€” instead of following Exit Strategy. Â¶ Nones: Russell Lee Moses counsels against reading too much into the Urumqi riots; that is, interpreting the unrest as a genuine threat to the Communist Party’s lock on power. Â¶ Vespers: It has been so long now that we’ve misplaced the lead that took us to The Neglected Book Page, where, as you can imagine, one thing leads to another. Pretty soon, we were perusing a list of 100 unread novels. Â¶ Compline: Villa Trianon was a dump in 1906, when Elsie de Wolfe and Elizabeth Marbury bought it for $16,000 and turned it into a showplace. After World War II, Elsie turned it into a showplace all over again. Now it’s a dump. My good friend, George Snyder, is looking for a willing millionaire to save it. Do you know one? Â¶ Matins: Max Fisher calls it semitarianism, and Peter Smith likes it. Now, eat your vegetables. Â¶ Lauds: The evolving aesthetic of public monuments finds interesting expression in a new 7/7 memorial, soon to be unveiled in Hyde Park. Â¶ Tierce: Ya gotta admit: the trial as eveything: Gurneys! Oxygen! A men’s room shut down for an hour, while Charlene comforts her traviato. Â¶ Nones: In the bad old days,Â utter nincompoops could inherit thrones. Now, they get elected. But the problem is the same: how do you get rid of them? The kid-glove approach taken by the Honduran Ã©lite seems not to have worked. Â¶ Vespers: Chalk another win up for NYRB Books: they’ve reissued L J Davis’s A Meaningful Life â€” now, 29 years after hardcover publication, in cloth. John Self enthuses. Â¶ Prime: Jay Goltz writes about our idea of very cool wheels: the 2010 Ford Transit Connect. Â¶ Tierce: More Madoff fallout: J Ezra Merkin will have to sell his $310 million worth of art. Â¶ Nones: Does the proposed withdrawal of all 27 EU ambassadors from Iran sound like a good idea to you? Not to us, it doesn’t. Â¶ Vespers: Emma Garman writes irresistibly about FranÃ§oise Mallet-Joris’s The Illusionist (Le Rempart des BÃ©guines, 1951), showing how it goes “one better’ than FranÃ§oise Sagan’s much better-known Bonjour, Tristesse. Â¶ Compline: Flash from the Past: George Frazier’s truly astonishing liner notes to Miles Davis’s Greatest Hits (1965): forget the blues, man; how’s my suit? Â¶ Lauds: Architect Michael Sorkin appraises Manhattan as a pedestrian town, and tries to think of buildings to suit. Â¶ Prime: More about Chris Anderson’sÂ Free: from Mr Anderson himself, at The Long Tail; and,Â in not so loyal opposition, from Choire Sicha, at The AwlÂ and from Brian,Â at Survival of the Book. A new digital divide? Â¶ Tierce: A star is born: Lisa Maria Falcone, formerly a person with money (and, more formerly, a person with no money), seeks a place in Gotham’s philanthropic firmament. A Cinderella story â€” adjusted for real time. Â¶ Sext: We don’t know whether to laugh or to shudder at this Sixty Minutes segment about fMRI mind-reading. Â¶ Nones: In futures trading on Iraqi stability, China gains access and standing in the petroleum business â€” aided by the American Senate. Â¶ Compline: The always thoughtful Richard Crary considers Michael Jackson, at The Existence Machine. So I find myself listening to songs I’ve known forever for really the first time, in my own time, paying attention to stuff I’ve taken for granted. And the main thing I’m struck by is the evident rage and pain in Michael’s vocals.